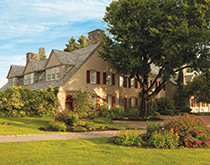 The Glenholme School, one of the nation’s most comprehensive special needs boarding schools, celebrates its fourteenth commencement amidst its 50th anniversary. The Glenholme School's Class of 2018. The Glenholme School, a special needs boarding and day school, celebrated its fourteenth commencement in Washington, Connecticut on Wednesday, June 20, 2018. It was an important celebration for the Class of 2018 and for Glenholme, as the occasion is distinguished by the school’s 50th anniversary. Over 200 parents, family members, friends, faculty, and fellow schoolmates gathered to salute the 18 members of the graduating class. Glenholme Executive Director Maryann Campbell provided a charming welcome address. She highlighted the history of the school, beginning with gift of the Glenholme Farm to the Devereux Foundation in the mid-1960’s and all the school’s amazing accomplishments on campus, in the community, and the around the world over the last 50 years. She followed with memorable tributes to the soon-to-be-graduates as their images scrolled across the backdrop. Ms. Campbell echoed praise to the graduates and all who supported them throughout their incredible journey. After the moving speeches, awards and scholarships were bestowed upon six most deserving seniors. The honors included the Susan Clark Memorial Scholarship and the Harry Van Sinderen Award for exceptional character values. Ms. Campbell returned to the podium to convey the Campbell Spirit Community Awards, recognizing two individuals for their participation in every after school program available that Glenholme has to offer its students. Following the honors, each member of the Class of 2018 received his or her diploma and time in the spotlight. Additional musical pieces were perfectly woven into the event including “Light of Glenholme,” the school song, and the graduates’ touching rendition of “Good Riddance (Time of Your Life)” summoned a few tears from the audience. With that, the Class of 2018 received a standing ovation, preceded outdoors, joined together in the celebratory cap toss, and enjoyed farewell festivities with lots of smiles, laughs, hugs, and warm partings. Congratulations to the Glenholme Class of 2018 on their notable achievements. They are matriculating to competitive universities, colleges, and career opportunities across the nation including Adelphi University, Mercyhurst University, Mitchell College, New Jersey Institute of Technology, Pace University, and Schreiner University. Devereux Advanced Behavioral Health — The Glenholme School, is an independent, coeducational, special needs boarding and day school for young people with high functioning autism spectrum disorders, ADHD, OCD, Tourette, depression, anxiety, and various learning differences. The program provides a treatment milieu designed to help students build competence socially and academically. The learning environment supports and enhances the ability for young people with special needs to succeed. Devereux Advanced Behavioral Health is a leading nonprofit behavioral health organization that supports many of the most vulnerable members of our communities. For more information about The Glenholme School and its program, visit http://www.theglenholmeschool.org/. The Glenholme School's viewbook highlights all the educational opportunities and the array of after school activities available to students. The Glenholme School in Washington, Connecticut.